Disorganized at Home? Take a Quiz! Disorganized at Work? Take a Quiz! Clients have often asked me about the OHIO (Only Handle it Once) rule while organizing their papers during my 18 years as a professional organizer. When they handle papers more than once, they believe they’re doing something wrong. Thinking OHIO should always be applied is a mistake. Maybe it’d be easier to follow if it went something like this: Only handle it once, moving it forward with each touch, to completion. While sorting the mail, you see an invitation with RSVP to a block party for your neighborhood. Maybe your spouse wants to go but he’s at work. You put it on the counter. One touch. Later, you pick it up to show him, then put it right back on the counter because you’re leaving to meet someone. Second touch. Your son in college may want to see his neighborhood friends. You pick up the invitation, scan it and text him. You drop it in your Pending folder. Third touch. After hearing from your son, you pick it up, RSVP, and recycle it. Fourth touch. Each time the invitation was handled was appropriate. You read the invitation while scanning the mail. You put the mail pile on the counter to deal with later. One touch. 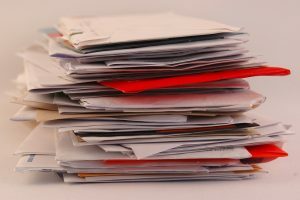 While flipping through the growing mail pile a couple of days later, you notice the invitation and move it to the to-do pile on the counter. Second touch. Later, you think maybe your spouse wants to go. You pick it up and put it on his desk. Third touch. After work, he hands it back to you to RSVP. You put it back on the to-do pile. Fourth touch. Your son may want to go. You pick it up to have the details ready, call him but get voicemail. It goes back on the to-do pile. Fifth touch. He calls back and you pick it up to give him the info. He’ll think about it. The paper goes back on the to-do pile. Sixth touch. He texts back. You pick up the invitation, RSVP, then recycle it. Seventh touch. You get the invitation, stop for a moment to consider whether your husband and son would want to go, and text them the details. You put the invitation on the counter. One touch. They both reply, you pick up the invitation, RSVP and recycle the paper. Second touch — and done. The differences are pretty obvious. But we really don’t stop to think about how many times we handle papers — and how much time we waste — so maybe this will get you thinking. The idea is to handle papers as few times as possible, not put them aside to deal with later except when necessary. Here’s a favorite time-management and productivity recommendation from David Allen’s book, Getting Things Done. His 2-Minute Rule states that if it takes less than two minutes, do it now. Brilliant! What’s the Secret to Stress-Free Holiday Decorating? How Well Do You Maintain Life Balance? My Site was Hacked — Is YOUR Site Protected? previous post: My Site was Hacked — Is YOUR Site Protected? To create a results-driven and fun experience. Customer service is of utmost importance–to meet or exceed expectations before, during and after your project. Professionalism, respect, nonjudgmental attitude and confidentiality (and a few laughs!) are guaranteed. Using this approach has created a history of successful client relationships. © 2004 - 2019 | An Organized Approach – THE approach for organizing success | All rights reserved.